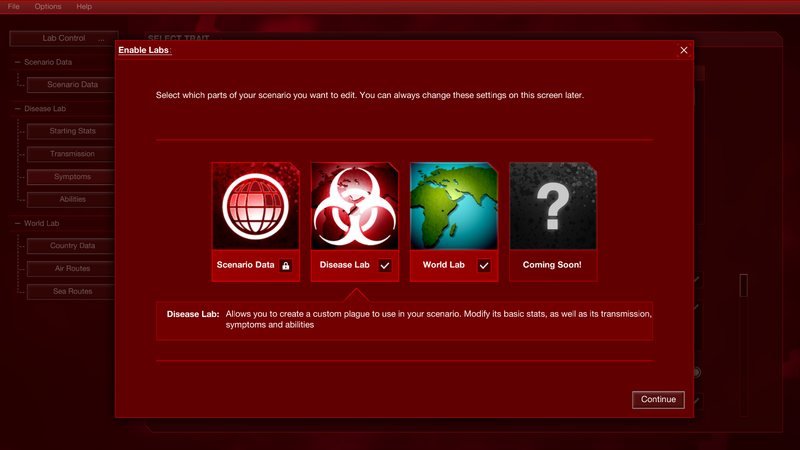 One month ago, we launched the Scenario Creator for Plague Inc: Evolved – a tool that lets players design their own scenarios from scratch. I’ve been blown away by the response, with over 1800 custom scenarios published so far and I can’t wait to see what people come up with in the future. Explore all of the tools available to you: The Scenario Creator is an extremely powerful editor – don’t be afraid to play around with lots of different options to see what they do – you may be able to do things that I didn’t think were possible! Start making something! – Even the best-laid plans will need to change a bit when you get started. Get a playable prototype up and running quickly as this will help inspire further brainwaves. It will also keep you motivated by letting you see the outcomes of your work. This was key when we were working on the Simian Flu expansion – the first few builds were borderline unplayable, but by getting just some of my ideas to exist in the game engine rather than on a piece of paper, it meant I could work on improving them and making them fun and satisfying. Think about the player: How do you want the player to feel when playing your scenario? What can you do to trigger these emotions? Try and distance yourself from your creation and think how you’d feel playing it for the first time. Generally, people like to experience something new / cool, be challenged or be part of an exciting story/narrative. Some of our scenarios play on or reverse typical Plague Inc. strategies or expectations – we enjoyed seeing the faces of players who opened the Nipah Virus only to be greeted with a blank symptoms screen. Additionally, in the Frozen Virus it was fun seeing at which point players realised what they were indirectly turning humanity into. How do you want your player to feel when they finally beat your scenario? Test and Iterate repeatedly – Perfection takes time and it is vitally important to make sure your scenario is fun and satisfying. Play your scenario and see how it compares to your original vision – what works and what doesn’t? What can you improve? Where might players get confused? Is it too easy? A great tip is to keep saving versions of your scenario as you go, so if you do try something that isn’t working as well, you can revert back to a previous build easily. This has definitely saved our lives a few times here in the office! Ask for help and share your experiences: There are lots of other talented people using the scenario creator. Feel free to ask questions or help other people out – everyone is learning together! Hopefully after reading this you’re inspired to get stuck into the Scenario Creator and make something amazing! I’ll be keeping an eye out for amazing scenarios to feature – let us know what you get up to in the forums and share your top scenario creator tips here. Rise of the Machines - You are a state of the art experimental AI system. Build up your core programs and seize the world in your iron grip! Day of the Triffids - Carnivorous plants which can move by themselves and sting with an infectious venom. A Demon Awakens - An age old demon awakes to bring humanity to its end. Once bonding with an initial host, It will use a variety of tactics to ensure humanity's demise. Vampire Plague - An unknown virus is spreading through New Transsylvania, It doesn't appear to cause harm. But Infected have got unusually large teeth. They also claim to taste Iron in their mouths, and some of them say to enjoy it! What will happen when this weird disease spreads? Lycanthropy - Several myths and legends from hundreds of different cultures tell stories of people becoming ravenous nocturnal beasts. Most of these beliefs have been attributed to curses or spiritual power... but not anymore.